It was a typical mad morning, we were rushing round doing the usual getting ready prep, while hubby took a moment to read some verses from Proverbs aloud (as he often does). it is destroyed when you are cruel..."
When we are kind we think we are doing someone else a favour - but at the same time we are feeding our own soul. Conversely when we have been are selfish/thoughtless/unkind to someone we may think we have done it to them, but at the same time we have hurt our deepest selves. Our own soul is damaged by our meanness. I grabbed a piece of chalk and wrote that one up on the kitchen blackboard for all of us to see and ponder. "What does nourished mean, mum?" "You know, like "fed". 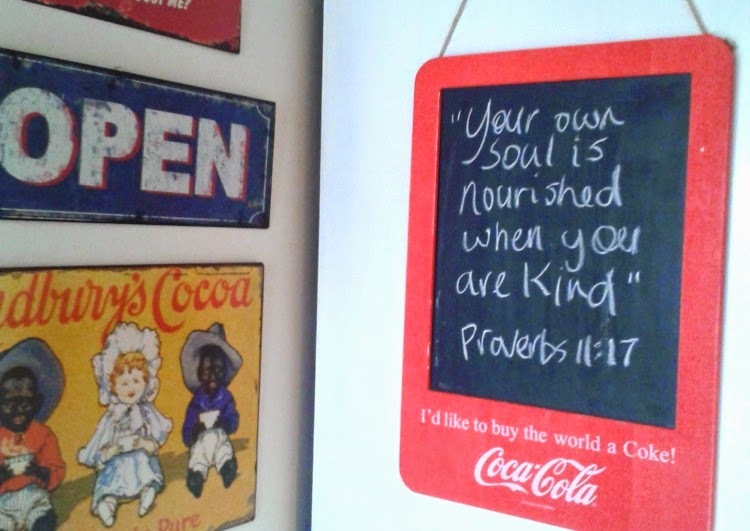 Your soul gets fed when you do kind things for other people..."
"Well, I mean, when you are kind it doesn't just do someone else good, it does YOU good too..."
"Yeah, nah, don't get it..."
"Mum, what is that, 'your soul is nooshed when you're a kid'? What is nooshed?" 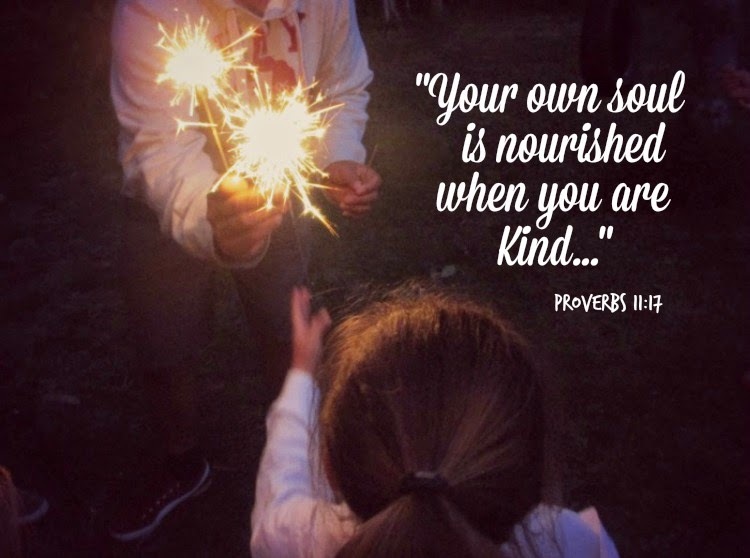 "Nourished, not nooshed. It means "fed". Like made stronger when you're KIND (not a kid). You soul gets stronger and healthier. Like when you eat veggies, they are good for your body...??? Kindness is like veggies for your soul???" "Ohhhh, um, yeah... nah... huh...?" Gee I thought it was obvious, and such a good nuggets of parenting wisdom. Ahhh well. We'll keep trying to reinforce the importance of kindness. Cos it's good for everybody's soul.